JOHN F. FILE. The pleasant little town of Sorento, which is notable for its phenomenal growth, is the place of residence of a number of retired farmers, who have accumulated a handsome competency in their calling, and have settled here to spend the halcyon days of the late summer of life. Our subject is a notable member of this class and has a very attractive home. John F. File was born in Ripley Precinct, Bond County, July 13, 1832. He is a son of George and Mary (Lyttaker) File, and was the third boy and fifth child in order of birth of a family numbering fourteen children, namely: Henry, Peter, Elizabeth, Margaret, Moses E., Catherine, George, Sarah Melinda, Nancy E., Amanda, Hester, James N. and Susan, beside our subject. Some of these children are now deceased. The survivors are honored and respected citizens of the locality in which they live. As to the ancestry of the File and Lyttaker families, but little is known beyond the fact that they were both of old Pennsylvania Dutch stock, who in an early day emigrated to North Carolina. There the father of our subject was born in October, 1798. His mother was born in Tennessee in 1808. In 1822, Mr. 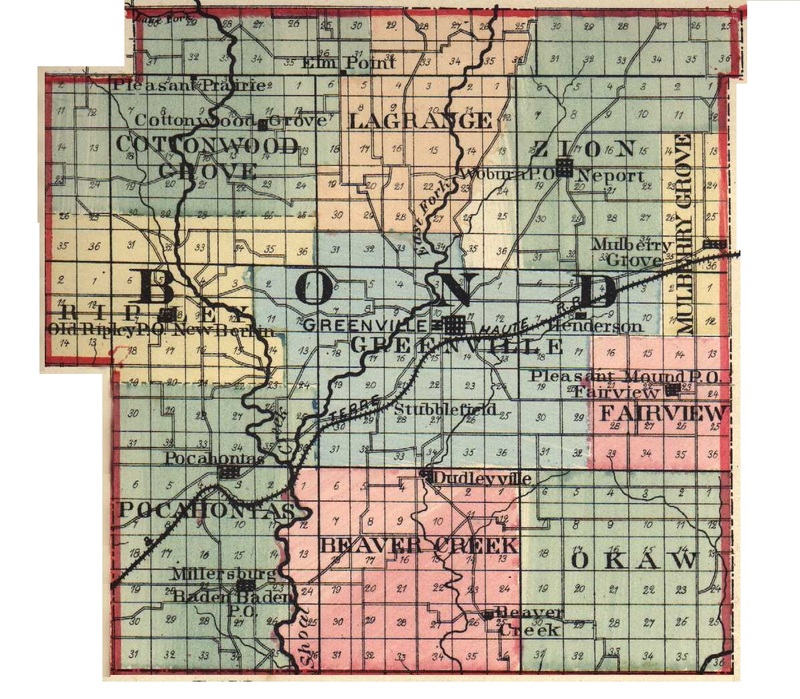 File came to Illinois, settling in Bond County, where he took up land, but for many years he was engaged in the distilling business. He died in Ripley Township in 1857. After his first prospecting tour in Illinois, in 1822, he returned to Tennessee and married our subject's mother. After a life spent in good works, this noble woman died in March, 1878, at the age of seventy years. John File grew up on his father's farm, receiving such education as was furnished in the common schools of the day. March 17, 1853, he was married to Miss Barsheba Willey, who was the eldest of six children born to Willis and. Frances (Mills) Willey, both natives of Nashville, Tenn., where the former was for many years a large slaveholder. The family early came to Illinois and located in Bond County, where his business as a farmer was only interrupted by his experience in the Mexican War. He went out with a Captain's commission and came back as a Colonel. He died in 1858, and his wife followed him in 1866. Mrs. File was born in Pocahontas Township, in 1836. Our subject and his wife have been the parents of nine children, as follows: Columbus was killed when but fifteen years of age, by being kicked by a horse; Mary F. is the wife of Hiram Chestnut, a farmer who served four years in the late war in the Third Illinois Cavalry; George W. lives in Greenville; Carey F. lives in Sorento; Emma J. is the wife of John Stafford, and resides in Sorento; Lemuel is a clerk in the hardware store of S. C. Cress, of Sorento; John F., Jr., Henry A. and Lula live at home. February 25, 1864, Mr. File entered the army, joining Company E, of the Third Illinois Cavalry. He entered the ranks at St. Louis and thence went to Memphis, afterward to Helena, Ark., then to Little Rock; in fact, was with the regiment in all their expeditions, fights and campaigns, including the expedition from Ft. Snelling, Mo., to Devil's Lake, Dak., and was mustered out of service at Ft. Snelling, October 10, 1865. On returning from the war, our subject rejoined his family in Ripley Township, and resumed farming operations. In 1867, he was appointed Deputy Sheriff of the county, and filled the office for seven years. He also served as Supervisor of his township, meantime continuing his fanning until 1890, when he moved to Sorento, where he has since resided. He has a small suburban farm which claims some of his time and attention. He is a strong Republican in politics, and is an equally ardent member of the Grand Army. He receives a pension of $10 per month. Extracted 20 Dec 2016 by Norma Hass from 1892 Portrait and Biographical Record of Montgomery and Bond Counties, Illinois, pages 297-298.